Dramatically increases storage space...Frees up counters. 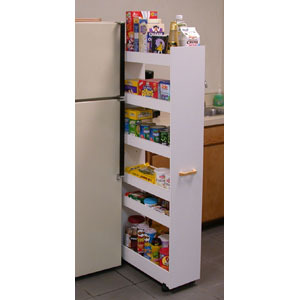 Modeled after our best selling laundry Caddy, the Thin Man Pantry Caddy turns unused areas of the kitchen or pantry into maximum storage space. Because it is on casters the Thin Man glides effortlessly into small seemingly useless spaces alongside the refrigerator or already loaded cupboards. When recessed you will hardly know it is there. It is however, extremely sturdy and will stand alone anywhere you put it. Will accommodate heavy cans, large cereal boxes, spices, bottles and anything else that needs a home. Elevated side panels prevent sliding and spillage. Every kitchen needs one. Every homemaker wants one. Available in white or oak. Item Weight: Approximately 47 lbs.